We lost our best friend and the joy of our life, Gabe April 12, 2012. 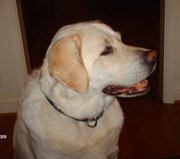 He was a beautiful Yellow Lab, 110 lbs and smiling all the time. We are crying everyday and the hole in our hearts is huge. He was only 8 yrs old and was diagnosed with acute lymphoma and in one week we had to say goodbye. I want to remember him as being truly loved and having a happy, wonderful life. I appreciate sharing him with you as it is very hard waking up everyday without him here. Living with guilt that it may have been something we did or didn't do to cause this awful disease. We want another dog but we don't want to replace Gabe. Don't know what to do? We lost our beloved black lab "Lucky" in March 2015, my daughter and I cried every day! I didn't want another dog! The family did, I looked in my work newsletter and saw "Lab puppies for sale" I called, she sent pictures and fell in love instantly, then sent picture to husband, he sent to our kids, who then called me asking if that's our new dog! Within a week of the passing of Lucky we had a new beautiful male yellow lab puppy we named "Bo" he has put so much joy in our life, we still miss Lucky but Bo has helped the loss so much! Gabe was a gorgeous animal. I am so sorry for your loss. I too have given up a beloved pet due to a terminal illness. The pain will never go away, but you can and will love again. It is the best medicine, trust me because I have been through it. Maybe, by the time this comment reaches you, you will have acquired a new pet in your life... I truly hope so. Being around others who have experienced this painful loss can also be of help. Gabe looked like a beautiful boy and I'm sure he was a gentle kind soul.You could never replace him,but,in time when it feels right,perhaps open your hearts and loving home to another dog,in memory of him. And that belongs to me. I am so sorry to hear of the passing of Gabe. It is awful when you lose a companion and very natural to feel that you shouldn't get a new dog knowing that at some point you will go through the whole grieving process again. It is also natural to feel that you could never replicate the bond and love you had for Gabe should you get a new dog. I went through exactly the same thoughts when I lost Gadget who was my best friend. It was two years until my wife persuaded me to allow her to bring another dog into the home but I am so glad she did. Although our new dogs will not replace Gadget they are wonderful and loving members of the family and I wouldn't be without them. I love them to bits and they bring such joy. Bring a new dog into your home and, although he won't be Gabe, he will blossom into a new, loving and loyal companion.